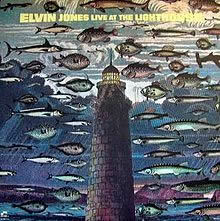 I just got a new download of a record that I, and many folks of my generation, wore out completely back in the day: Elvin Jones Live at the Lighthouse. In addition to the aforementioned Mr. Jones, it features Steve Grossman and Dave Liebman on saxes, and Gene Perla on bass. For a lot of young players in the 70's (particularly of the saxophonistic variety), this was something of the bible of modern harmonic/melodic concepts and execution (of the post-Coltrane variety). I hadn't heard any of this music in about 20 years, and have spent a lot of time in the last 10 years listening to music other than jazz, so I was curious to check it out. Right from the git go, it's all about the horns. There is so much playing on the intro of the first tune Fancy Free, that it's almost overwhelming. Considering that Grossman was about 19 and Liebs about 25, what they do is amazing. Actually it's just amazing, period. Dudes could play! I had transcribed Lieb's second chorus on Fancy Free back in the early 90's, but I can't track it down, so I just might do it again, especially since I have the technique now to play some of this stuff (it's tricky on guitar!). It would be a lot of fun to try, anyway, and just adapt some of things that I still couldn't do.